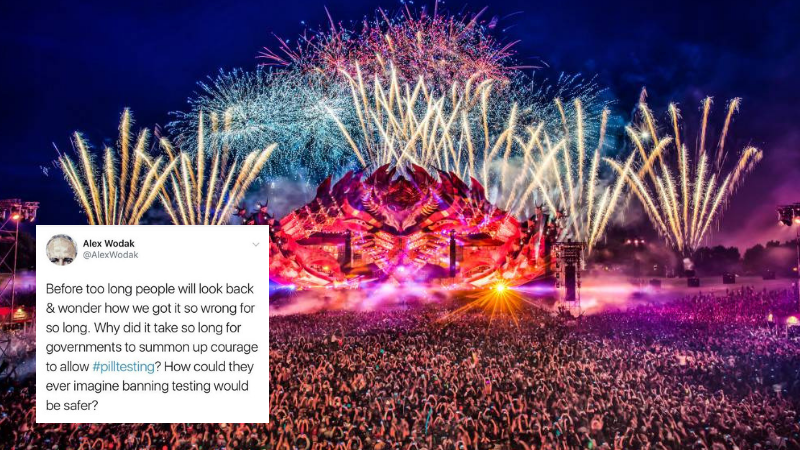 The fatal overdoses of two punters at Sydney’s Defqon 1 over the weekend has re-opened the discussion around illicit drug use, harm minimisation and music festivals in general. Is this real-life Australian politics? Or a weird Australian remake of the ‘80s classic Footloose? The premier’s response is dangerous for a few reasons, not to mention the fact that the zero-tolerance stance has never worked. Remember 1920s America? The first problem is it stigmatises young people as the only ones to employ risky substance use, and blames one festival for encouraging it. It’s obvious that making a mass attack on “youth culture” is the easiest way to derail the real conversation of preventable deaths and appease out-of-touch Australians. NSW premiers have a track record of using the random, unlikely deaths of young people to push their no-fun agenda. Secondly, it ignores the real issue of substance abuse and the plethora of evidence that harm minimisation works. Instead of looking to the proof from countries across the globe, our pollies stick their fingers in their ears and sing, hoping all rationality and logic disappears before anyone notices. Recent data from the Australian Bureau of Statistics shows that the use of illicit substances has doubled in males aged 50 and over. And while people aged between 18-24 are still the most likely to experiment with illicit drugs, that rate has dropped by 5% since 2001. Out of the approximate 30,000 attendees at Defqon 1, two people died. That’s about a 0.006% fatality rate. Every year, more than 60,000 people are admitted to hospital on alcohol-related causes, and according to the Cancer Council, alcohol attributes to over 5,700 deaths annually. Prescription drugs continue to be the leading substance of abuse among Australians. According to Royal Life Saving’s 2017 report, almost 300 people drowned between 2016-2017. Let’s! Ban! Swimming! In 2014, a 27-year-old runner collapsed just before the finish line at City 2 Surf and died in hospital shortly after. So of course, then NSW Premier said that he never wants to see this event held in Sydney or NSW ever again, and he’d do everything he can to shut it down. Oh, wait, no. Instead, people requested that defibrillators be present at all sporting events. And the biggest cause of accidental deaths? Falls. That’s right: No walking for anyone! And does anyone know if we’ve fixed the overwhelming rate of a person every three months being torn to pieces by a crocodile in north Queensland? So how can we strike a balance of safety and (God forbid) letting young people have fun? 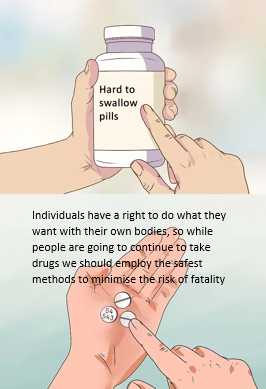 The answer is through harm reduction and minimisation. Greens leader and drug and alcohol doctor Richard Di Natale has been advocating for pill testing for a while, citing the multitude of evidence from both Australia and overseas that shows the benefits. The Netherlands has had government-implemented pill-testing since the early 1990s, with the flow-on effect being that it crashes the black market. Drugs are tested for their contents, and any dodgy substances are then publicly announced, which leads to less consumption. Austria’s independent pill-testing initiative Check-It has seen results of up to 50% of drug users say no once their substances were analysed. Portugal decriminalised drug possession in 2001 and seen mass drops in overdose, drug-induced violence and robbery and HIV rates. Instead of locking up possessors, they are referred to health professionals and social workers to receive help. President of the Australian Medical Association Dr Tony Bartone made it clear that pill testing does not encourage the use of illicit substances. Remember when the introduction of needle and syringe programs led to a mass increase in drug use? Because providing safer equipment obviously means more people will be enticed to use drugs, right? Neither do I. Providing pill-testing services will not encourage more people to take pills. It just acknowledges the fact that people already are, because (at least for now) we do still have bodily autonomy in Australia, and no amount of old people yelling will stop that. But don’t let the expert opinions get in the way of your mindless power trip, Glad. If you hadn’t heard, Gladys has gone full-bureaucrat and devised an “expert” panel to solve the mystery of how to make festivals safer. The three-person panel consists of only one health professional: NSW Chief Medical Officer Dr. Kerry Chant. The other panellists include the chair of the Independent Liquor and Gaming Authority (why?) and the NSW Police Commissioner. Does anyone else smell corruption? To add insult to injury, Gladys said that even if the panel finds pill-testing to be the answer, it will be vetoed immediately because she “does not support a culture which says it’s okay to take illegal drugs.” All sounds a bit pointless, doesn’t it? Next thing you know the government will spend $120 million on a non-compulsory, non-binding vote to allow equal rights to gay coup… oh. As the SBS’s Jill Stark put it, Australia’s War on Drugs is failing; and if the definition of insanity is repeating the same thing over and over and expecting a different result, our government must be batshit crazy. So, Gladys, as a regular attendee of music festivals and someone who has accepted that people take drugs, I am begging you to get your head out of the sand and take a proactive stance on festival safety: educate, inform and support. Stop pretending that drug use will go away if you turn your attention elsewhere. Because until something is done, the next death at a festival is on your head.